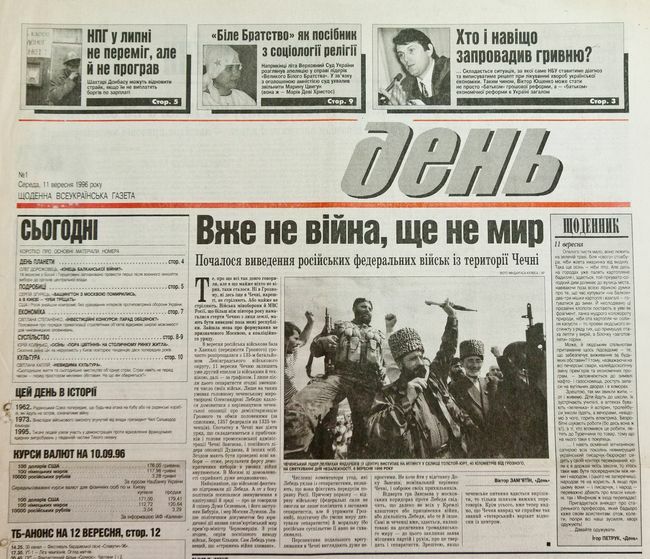 The first issue of Den came off the presses on September 11, 1996. Today’s issues of Den/The Day are very different in terms of makeup and design, complete with color photos, being more compact, using various fonts. It remains Ukraine’s first periodical to have started being published with online versions. Beginning in 2012, every Friday issue has had a glossy supplement entitled “Route No. 1,” featuring historic and cultural sites, along with other tourist attractions. Den became a major media brand, including the unique education projects Summer School of Journalism and Library Book Series (this year’s Book Forum in Lviv will boast the 35th book entitled “Ave. Centennial of Hetman Pavlo Skoropadsky”) and the International Photo Contest (this year it will be held for the 20th time). With all upgrading, the Editors remain true to their credo: intellect, truth, and principle. Below are comments by regular subscribers, Summer School of Journalism graduates, and Editor-in-Chief Larysa IVSHYNA.